Agastache foeniculum, Anise hyssop is a perennial herb that tastes as good as it looks. It is popular in the border and in the herb garden, a favourite plant of bees and gardeners alike. It is, perhaps one of the most gratifying plants you can grow. Agastache foeniculum, often sold under its alternative name of A. anisata, and occasionally A. anethiodora, are excellent design plants, exhibiting a strong vertical accent they makes a good foil for other plants in the garden. The tall stems grow to around 90 to 120cm (36 to 48in) tall. In summer they produce long spikes of blue flowers and stay in colour for months. The deep green leaves are oval shaped with toothed margins.The dried seed heads look good in the winter garden and small birds like to eat its seeds. Very easy to grow, the plant is tolerant of deer and drought and is hardy down to minus 28°C (-20°F) and will develop into a large clump within a few years. It prefers partial shade but does very well when situated in full sun. It makes a striking addition for the back of the perennial border, pairing nicely with other tall varieties such as Japanese anemones, and tall campanulas. Often referred to as a ‘Wonder Honey Plant’, it produces copious amounts of nectar for bees and butterflies to feast upon and is an important crop for commercial honey production. Bees hold an undisputed attraction for the flowers, the colour and shape being among bees' favourites. It is estimated that just one acre of Agastache can support over 100 hives. 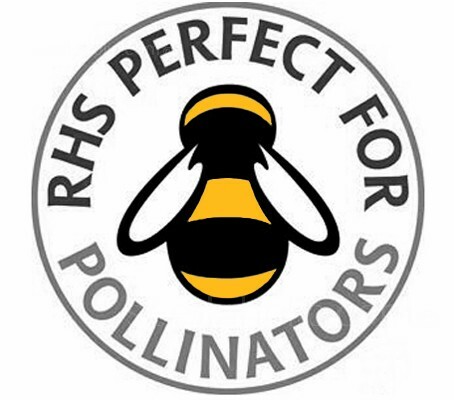 Together they produce an excellent, lightly fragrant honey that is popular with bee keepers. Herb lovers claim it as a culinary herb, the leaves are used to make teas, cordials and salads. A savory seasoning can be made with the leaves chopped with other herbs such as thyme to rub on poultry. The flowers are edible with a lighter anise flavour than the leaves and make for a tasty and beautiful garnish or addition to a salad. Pluck any one of the flowers, pop it into your mouth, and discover perhaps an initial citron flavour followed swiftly by a drop of sweetness. Sowing: Sow February to March or April-June. Sow early in February-March under glass to flower September-October, or sow April-June to flower June-September the following year. Seed can also be sown directly in the ground in spring. Sow under cover; sow in warmth to germinate; prick out and harden off in late spring. Or sow direct in autumn when soil is warm. Protect seedlings throughout winter. Likes rich moist soil and full sun. Sow the seeds into cells or pots containing good quality seed compost. Sow finely onto the surface and press lightly into the compost, but do not cover, as light aids germination of seeds. Place in a propagator or cover with a plastic lid and place in a warm place, ideally at 18 to 20°C (65 to 68°F). Water from the base of the tray, keeping the compost moist but not wet at all times. Germination 14 to 28 days. Once some of the seeds have germinated air should be admitted gradually otherwise the seedlings may suffer damping off. Once the seedlings have their first pair of true leaves (they come after the seedlings first pair of leaves) and are large enough to handle, Prick out each seedling into 7.5cm (3in) pots to grow on. Gradually acclimatise to outdoor conditions for 10 to 15 days before planting out after all risk of frost has passed into well drained soil. Plant 30cm (12in) apart. To prepare ordinary garden soil for planting, add 5cm (2in) of gravel and 10cm (4in) of compost. Mix in well down to 30cm (12in). Dress plants with gravel to keep water away from crown to prevent rot. Agastache prefers free-draining soil but tolerates almost any soil and will cope with dry, poor soils very well. They can be grown in full sun but will take some shade if dry. As is typical of many aromatic perennial herbs, a 'tough love' approach works best—full sun and not too much water or fertil­iser. In fact, most plants will need little, if any, supplemental irrigation. In dry climates, a deep soaking every week or two during the summer growing season is adequate. The sturdy plants will usually not need staking, but you may need to do so if planted in rich moist soils or in exposed positions. Although agastache already boasts a very long flowering period, usually until frost, the plants will be stronger and more floriferous if you cut back flower stalks as flowers fade. Agastache are short-lived perennials, don’t worry too much if your plant keels over after three or four years, you haven’t done anything wrong. They will self-seed where happiest, but this is usually never enough so collect the seed to ensure that you will never be without. Remember that when different Agastache species and hybrids are planted in the same garden, they will cross-pollinate. Watch for volunteer seed­lings, and weed out individual plants that don’t demonstrate desirable habit and flower colour. A few Agastache species are not reliably hardy, especially in wet winters, but Agastache foeniculum is one of the hardiest of the species, to around minus 28°C (-20°F). Take care when mulching hyssops, especially in wetter climates. In these areas, it is best to avoid mulching materials like composted leaves, lawn clip­­pings, and bark chips since they can encourage the growth of fungal and bacterial pathogens. Pine needles are a better choice, but a few inches of crushed-gravel mulch is ideal. Cottage/Informal Garden, Flower Arranging, Flowers Borders and Beds. We do only just seem to be waking up to the herbal essences of Agastache. There are, however, around a dozen different species, some of which earn their place in the herb garden better than others. All have deliciously, spicily scented leaves as well as those lovely smoky blue or purple flowers. Take one or two and chew them and you’ll freshen your breath with its clean, savoury flavour. Pick young growth and sprinkle in salads, use to decorate cakes or float in drinks. Agastache added to your Pimms lifts it to a higher sphere altogether, or make a tea, the mintier ones, like A. rugosa, often have a better flavour, the crushed leaves smell strongly of mint or aniseed and are often likened to liquorice. You can dry the leaves for potpourri and also flavour meat, specifically pork, with a uniquely piquant tang, either aniseedy or minty depending on the species you choose. 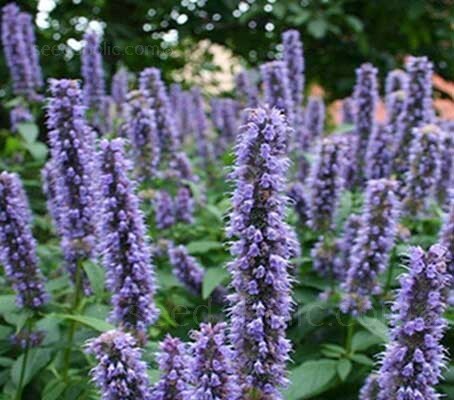 Agastache, is a genus of 9 to 12 species of perennial herbs in the mint family, Lamiaceae. Agastache foeniculum is native to much of north-central and northern North America, notably the Great Plains and other prairies, and can be found in areas of Canada. Also known as hyssop or hummingbird mint, these plants are famous for their ability to attract hummingbirds and butterflies. Most species are very upright, with stiff, angular stems clothed in toothed-edged, lance shaped leaves. Upright spikes of tubular, two-lipped flowers develop at the stem tips in summer. Pronounced ag-ah-STAK-ee fen-IK-yoo-lum, the genus name is related to the flower clusters. Agastache, from the words agan, meaning ‘very much’ or ‘many’, and stachys, meaning 'an ear of corn or wheat’ and refers to the abundance of terminal flower spikes that bedeck the plant through much of the growing season. The species name, foeniculum, means fennel, another herb that smells aniselike. Agastache foeniculum is most commonly known as Anise Hyssop, The leaves and tiny lavender-blue flowers smell and taste similar to anise. Other common names include Blue giant hyssop, Fragrant giant hyssop, or the Lavender giant hyssop. It is interesting that all these common names refer to another plant, and though it is called hyssop it is not, and it is not related to the hyssop, Hyssopus officinalis, the European member of the mint family traditionally used as a healing herb. Hyssop has needle-like aromatic foliage that is nothing like that of the agastaches, however, the individual tubular flowers of both herbs are similar in having two pairs of protruding stamens, which may explain the association. 30 to 38cm (12 to 15in).